Emily Brontë, painted by her brother Branwell. 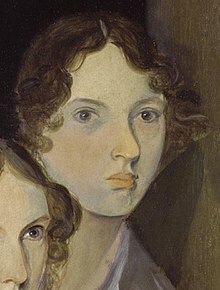 Emily Jane Brontë (30 July 1818 – 19 December 1848) was a British author and poet. She is most famous for her only novel Wuthering Heights (published in 1847). She wrote under the pen name Ellis Bell. Brontë had two sisters, Charlotte and Anne, who were also writers. Her brother, Branwell, was a painter. She co-wrote the poetry collection Poems by Currer, Ellis and Acton Bell (1846), with her sisters. She was born in Thornton, West Riding of Yorkshire, England. She attended Cowan School with her sister Charlotte. Brontë died of tuberculosis on 19 December 1848 in Haworth, West Riding of Yorkshire. She was 30. ↑ "Emily Brontë". Encyclopædia Britannica. Retrieved 12 September 2018. This page was last changed on 12 September 2018, at 03:14.